National Plan for Vacation Day is January 29, and to help celebrate, Miles held a company-wide “Share Your Travel Story” contest. We provided a few guidelines – the story had to be a true, relate to just one specific travel experience (rather than a recap of all travels) and, as an added challenge, under 200 words. Writing an entertaining travel story under 200 words is no easy feat! But our talented team rose to the challenge. Everyone got to read all the entries and vote, and we rewarded the winners with some great prizes to help them plan their next adventure. In the spirit of National Plan for Vacation Day, we wanted to share some of our team’s stories to help inspire your own travels – and to encourage you start planning your next trip! The campground line for Telluride Bluegrass starts days, for some even weeks, before the festival starts. That’s why I reserved a cabin in Mountain Village for the 2018 show. Sturgill Simpson headlined. He was the main reason I loaded up the family and made the drive over Colorado’s Million Dollar Highway last June. Music rattled off the mountains for 3 days. Banjos and fiddles, craft beers, a random Allman Brothers cover, gondola rides, and some gospel – because I needed the healing – were highlights. But, Sturgill stole the show with a Sunday night closing set of the full on get down. When he walked out of the cabin across from mine Monday morning, Sturgill saw Kentucky stickers on my car. We talked about bars and bands back where we both come from. I thanked him for writing songs that rock. Said they “inspired us” and that I’d see him later that summer at another festival in Iowa. He laughed and left for breakfast with his family. One time I went to Sicily and volunteered with a group of students who were revitalizing a farm that had been seized from the mob and given back to local farmers. I made friends with a farmer who didn’t speak any English and started helping him plow the land aboard his tractor. I’m from the suburbs...I have no experience with tractors. I put my hand in the wrong place and all of a sudden BOOM—I accidentally chopped off a piece of my finger. I remained calm, tapped my new friend on the shoulder to show him my issue and learned the only Italian word I will never forget: dolore (pain). He put pedal to the metal on our tractor and we sped down the farm whipping past crops at a lively 10mph. After a trip to the local hospital and one amputazione operation (it sounds worse than it was), I was good as new. The most Italian part of all—my new farmer friend was waiting for me at the hospital with fresh pastries when I got out of surgery. The Italians really know how to brighten up any situation. I’d go back in a heartbeat. I finally had the chance to take my Mom and Stepdad (a hero in my life since I was 8) on a long-awaited tour of Yellowstone, where I worked during the summers in college. We explored for miles as streaks of golden aspen flashed by. We saw a mama moose and her babies, ate barbecue in a teepee, slept on a ranch, soaked in hot springs, drank from horse-saddle barstools, watched a thunderstorm roll in over a field of bison. My Stepdad wasn’t quite himself on the trip. He struggled with activities and tired easily, but his sense of humor never dulled. One day, Mom and I returned from a hike to find him in the Old Faithful Inn surrounded by a group of travelers who had gathered around him to listen to his storytelling. They were all captivated by his charm. Upon our return, he was diagnosed with a rare terminal illness which has led to homebound hospice care. His travels are now limited to memories, but our Yellowstone adventure continues. 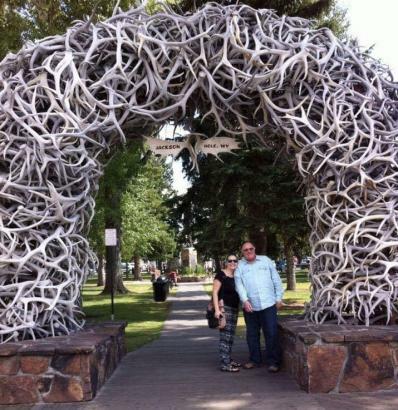 A Japanese couple from Old Faithful flew to visit him recently! When his big, bright happy sun sets upon the horizon, I think a bison will be there. Be the maid of honor in Antigua, Guatemala, where? Antigua took a 4-star kind of gal out of her comfort zone and opened her eyes to a whole new world. Our accommodations were a quaint bed and breakfast with an open courtyard, views of volcano overlooking the city, and a balcony next to a beautiful historical church and convent damaged by an earthquake in 1773. In this old colonial city that was destroyed by earthquakes, we saw the most beautiful churches, three immense volcanoes, and street vendors selling handmade jewelry, clothes and handbags. We attended The Day of the Dead Kite Festival. This magnificent site takes place on November 1st each year. These massive, colorful, handmade kites were flown into the air over the crowds – wasn’t sure whether to be in awe or run for my life! Antigua surrounded me with simplicity, natural beauty, culture and a newfound respect for what us Americans take for granted (i.e. drinking water). Lacking in lots of frills, but beautifully allowed the opportunity to focus on the most important things – family, friends, and making memories. Antigua will be in our hearts forever as, to our surprise, our son was born 9 months later. This past summer, we drove from Croatia to Montenegro, a tiny Balkan country on the Adriatic Sea. 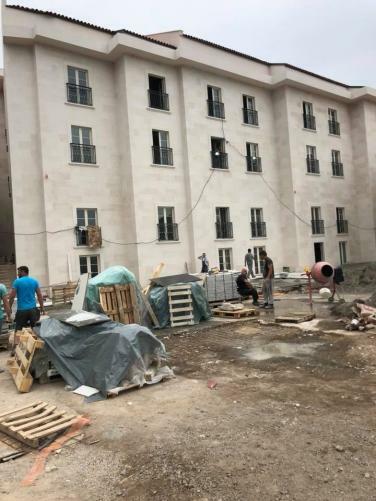 We’d been staying in sparse Airbnb accommodations and were looking forward to an amenity-laden hotel that was billed online as five-star luxury, a former palace by the sea. We’d seen photos of a grand, multi-story stone structure. We had a confirmed reservation. We were already picturing ourselves relaxing by the pool and indulging at the spa. When we arrived, locals seemed confused when we asked for directions to the sprawling new resort. They spread their arms out — indicating you could see the entire seaside town in a single glance — and we didn’t see any palaces. What we did see was a construction site with a half-dozen workers and half-finished buildings. We never learned how the hotel had confirmed a reservation for a room that didn’t exist, but we drove on to another — and we told ourselves, better — town and checked into a perfectly adequate, perfectly sparse room. We didn’t have a pool, or a spa or a sea view, but we did have a wonderful time exploring the town instead of lazing away in hotel amenities. I was fortunate to experience a 3-week “Around the World” group travel tour, where my adventures ranged from dining at the luxurious Burj Al Arab hotel in Dubai to hiking in the hills near remote villages in rural Nepal. Of all places, Nepal was my favorite country, and to this day the most memorable. After a 2 ½ hour-bus ride, our group arrived at the designated hillside spot to start the hike. 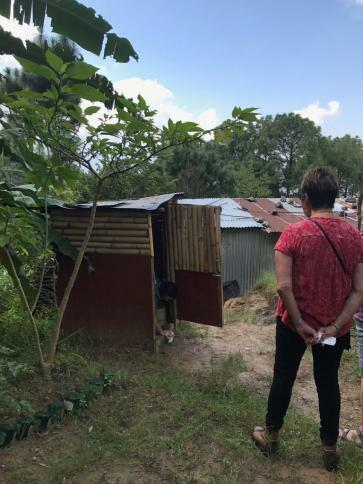 For those of us who had to use the facilities, there was but one, tiny outhouse built around a hole in the ground. As the men scurried off into the trees, the ladies patiently waited in line, holding pieces of toilet paper (and their noses)! When it was finally my turn, I bravely stepped inside and closed the door. It was disgusting and very dark. While in the squat position, I did my best not to touch anything, but lost my balance and fell forward against the door, which went flying open, causing me to fall forward outside, with my pants around my ankles. To make things worse, one of the ladies happened to be taking pictures just as I came flying out. So unfortunately, there’s proof. Riding through scrubland on a sunny morning game drive, our guide spotted the kill hollowed out under a tree. Nearby, a full-bellied lion rested under a twisted mess of branches. It was the end of Botswana’s dry season, so leaves were sparse and we could see the lion clearly, including the bloodied fur around his mouth. The lion stood up and strolled away. Hoping to get another glimpse, we circled around and drove into the dry riverbed. Our guide killed the engine and we waited. Soon the lion emerged from the treeline and headed down in our direction. As he kept on toward us, I sat in awe and disbelief. He could so easily end me. Finally he stopped about 20 feet away, flicking his tail in the sun. Before long, he headed for a watering hole in the riverbend. We followed and stopped across from the small pool. 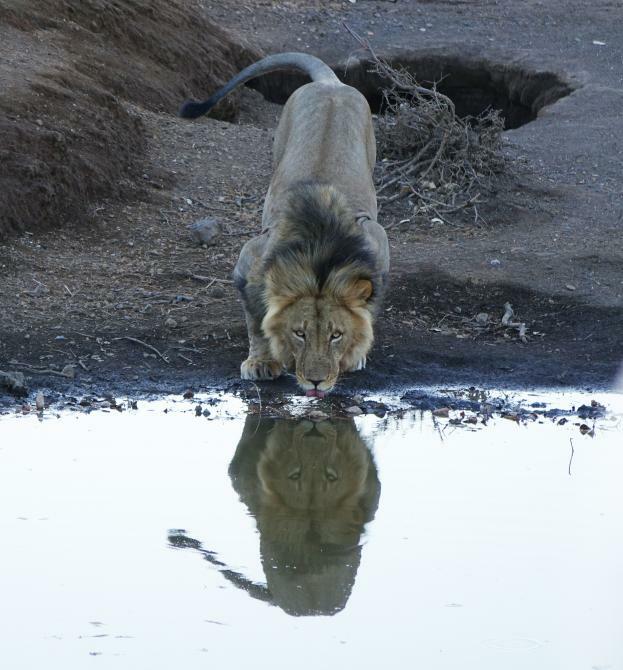 Crouching gingerly at the water’s edge, his reflection sharp as glass, the lion hesitated. He looked left and right, scanning for faint ripples or crocodile eyes. Then slowly and delicately and watchfully, he sipped. And in that moment it was perfectly clear that this ferocious beast knew fear. “Oh, is this private property?” I asked apprehensively, eyeing the No Trespassing sign. Laura swung her leg over the metal chain one at a time. “It’s just to keep the tourists out,” she laughed, adjusting her sunglasses. I marveled at my friend — now considered a local — who moved to Spain a few years prior, making herself right at home in the idyllic countryside of Majorca, an island 130 miles off the coast of Barcelona. The summer sun was intense, roasting our shoulders as we walked along the dusty trail, which Laura promised led to a secluded pocket of sandy beach, tucked into the island’s rocky shoreline. It wasn’t long before I could hear people laughing and the faint beat of music playing in the distance. 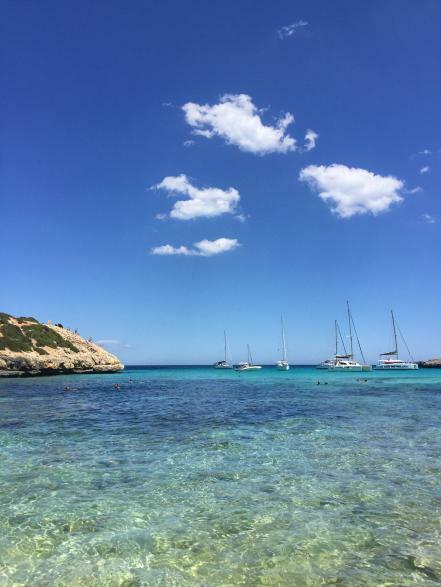 Beneath our feet, the dirt transformed to sand, and there, through the shrubbery, was the cala — a hidden cove of creamy sand, lined by jagged cliffs where bronzed sunbathers dove into the crystalline waters of the Balearic Sea. We spread out our blanket and spent the afternoon as locals: swimming, napping, feasting on bocadillos — crusty bread rubbed with ripe tomato and lined with lustrous jamón serrano — and sipping chilled white wine in the Mediterranean sunshine. Snails crawled out from the underbrush of the field so that, as my classmates and I painted the landscape, the snails would climb the easels, find their way into our backpacks and end up smashed between sketchbooks and tubes of oil paint. They told time slowly and gently. We spread out on some French family’s property our professors had struck a deal with. Find a solitary spot, set up, paint. We attempted landscapes of Mt. Saint-Victoire, olive groves and cypress trees. It smelled like dirt, lavender and charcoal. The snails crept, the sun climbed– time to leave. The bus driver wasn’t one to wait. I came back from France with snails smashed in my sketchbook and bottles of wine. The scent of an adventure doesn’t linger long. Photos don’t do justice. And even a bottle of crisp rosé made in Aix-en-Provence doesn’t taste like it did when it was drunk with friends after dark in the square where we dragged out a dining table and guitar for long happy hours under the stars. Nothing is quite like travel. But if I had to describe it, it’s something like making bad paintings where the snails creep, slow and curious. “You don’t even know what I was going to ask”, I replied. 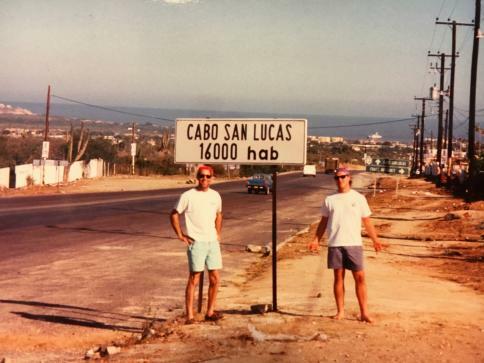 So, that’s how the planning started and ended for a very spontaneous road trip to Cabo San Lucas. Two days later, I picked up the Doctor at San Diego International and he joined me on my nomadic meandering down Highway 1. After two days of enjoying the Baja scenery, sleeping on uninhabited beaches and exchanging stories with my college friend, we finally ran out of asphalt for my Jeep. Life was good until the day before we began trekking back to the US. Then some recent arrivals warned us that the only paved road was washed out near Ensenada. Oh, oh, now what? And with that, we veered off on an unpublished route that proved correct and unforgettable. As they often say, the best laid plans….But every plan, even sketchy ones, starts with an idea.